The College Bum, Sean Teeter, is back with another Star Wars review. This time it's the Fan Favorite #5, Captain Antilles - take it away, Sean! Hasbro introduced us to the Fan’s Choice figures back in the short-lived Power Of the Jedi line. Basically Star Wars fans voted on the Hasbro web site from a small group of un-produced characters in the Star Wars universe for the one they really wanted to become realized in plastic. The first was Ellorrs Madak, one of the background aliens in the Cantina scene. Next came a deluxe packaged Amanaman –the only Fan Choice figure to have a predecessor in the vintage line. Number three was the near-legendary Ephant Mon who was almost never found on the racks due to very poor execution from the regional shipping angle. 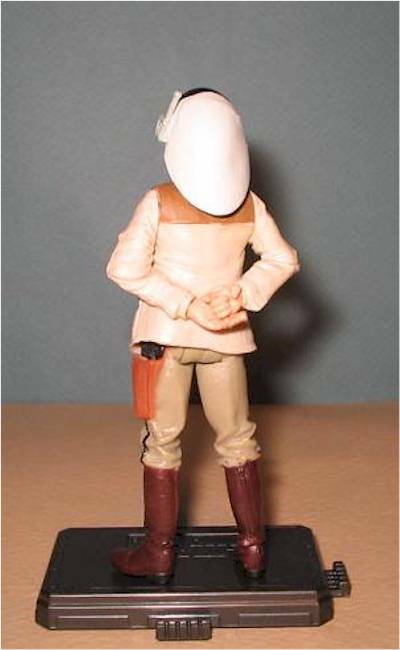 The fourth was the McQuarrie concept Stormtrooper, a figure I still have yet to see anywhere on the racks despite having been out since last year. Because of this rarity, these last two command some rather high prices on the secondary market. The fifth figure is hitting the shelves now and from what I’ve seen, there’s no problem finding Captain Antilles at the local Target. 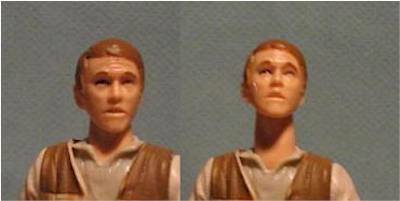 Of course if everyone remembers, Antilles virtually tied with General Jan Dodonna in the fan poll, so Hasbro decided to produce both figures even though Antilles will be the only one with the Fan’s Choice sticker. Jan’s also showing up in decent quantities as well so you can snag both if need be. I think a lot of fans were slightly disappointed by the selection of characters listed in the polls this time around, which might explain the number of these guys warming the pegs. This package also has the red Fan’s Choice sticker on the bubble. 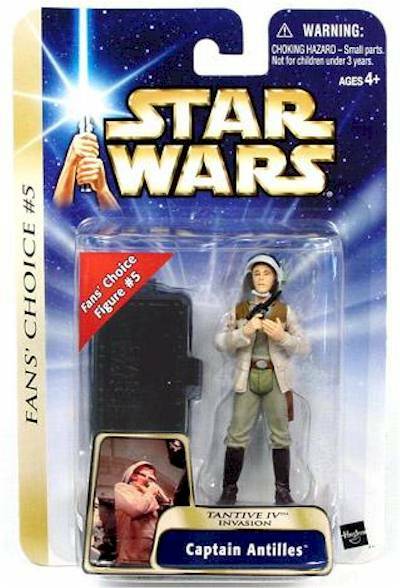 The gold stripe is labeled as “Fan’s Choice” as opposed to “A New Hope”. It’s kind of hard to see Antilles’ face in A New Hope since his entire onscreen appearance consists of Darth Vader choking the living crap out of him. 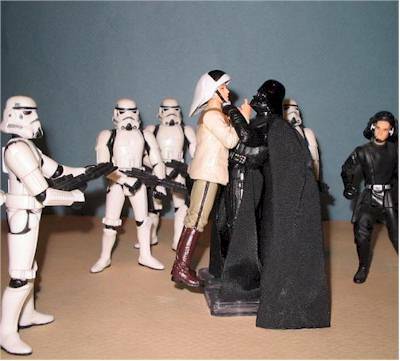 Scale-wise, he appears to be a little too tall to reproduce that same scene with any of the Darth Vader figures out there. The main body looks fine: there’re plenty of wrinkles in his pants and the pockets on his vest are nicely done. The sculpted holster also works well in conjunction with the vest –hiding the captain’s side arm. The hands are okay. One is open wide and the other is sculpted with an extended trigger finger. It looks a little awkward without the pistol in it, but I guess you can pose Antilles scratching his nose with it every now and then. The angles of the arm sculpt really limit his posing to just a couple of positions, and the added articulation doesn’t help it much. The face is kind of strange. His expression just doesn’t seem to match up with any action you could possibly place him in. In fact, he looks kind of like Haley Joel Osment. I see dead Stormtroopers . . . The fact that he’s not the most exciting figure to sculpt kind of works against him a bit here, especially since all the other Fan’s Choice figures looked pretty damn good on display. Antilles is just kind of humdrum. Anywhere there’s brown on his body (boots, shoulders, belt, holster) there’s some bleeding to be found. The eyes also appear to be kind of squinty. There’s just too much black liner used at the lids. Other than that, he looks pretty close to the source material. There are some interesting things afoot in Captain Antilles. First off, he has eleven points of articulation: a limited ball-joint head, an extendable neck peg, and cuts at the shoulders, elbows, wrists, waist, and hips. You can’t really pose Antilles too much. I would have liked knee joints so he could crouch down with the other rebel defenders, but his legs are stiffer than good bourbon. There’s a little play with his arms however and you can position them in a good “at-ease” stance behind his back. As noted on a few other web sites, both Antilles and Dodonna’s arms can pop off, allowing for easy removal of their sculpted jackets. 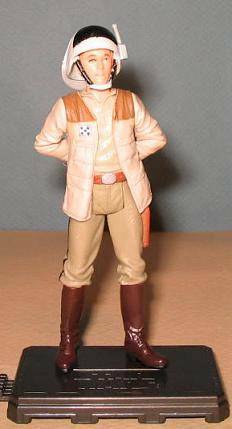 This is great for those of you who love customizing figures, especially since the jacket is identical to the one worn by Dodonna in the war room scenes in A New Hope, except for the insignia color. Here’s a link that Mr. Crawford was nice enough to point my way. The other oddity is Antilles’ neck. It stretches out of his body. 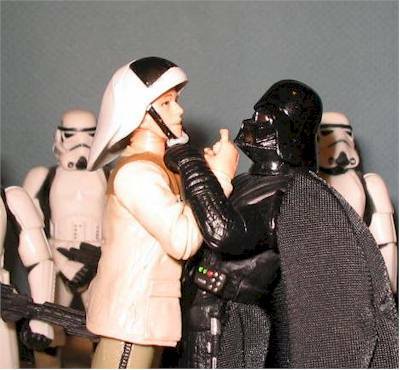 I guess this was intended to make it easier to allow a Vader figure to choke him, but it doesn’t really help and just looks pretty odd. Guess his full name is Stretch Antilles. Antilles comes with a blaster, a helmet, and a stand. The stand seems to be Hasbro’s standard filler accessory nowadays. It’s okay, but so far none of the figures packaged with it really need it to stay upright. The blaster looks nice, but is missing the silver paint ops seen in the movie with the other rebel troops on the Tantive IV. The same blaster is also packaged with Jan Dodonna and Dutch Vander, Gold Leader. Since this appears to be the only accessory with this figure that isn’t a total reuse, it’s a real shame that a little extra care didn’t go into it. He’s pretty solid, even with the removable arms. I don’t think he’s going to suffer too much damage. His helmet strap might however. I paid $4.99 at the local Target, and only felt okay about it. He just doesn’t come with a whole heck of a lot of value when compared to some of Hasbro’s other figures on the pegs. Pay more than five dollars and you might feel slightly ripped off. Amazon.com briefly had him in at $7.99 a pop. He’s currently out of stock, but more are on the way. They also have some of the other new figures in as well. Cloud City has him for $9.99 on C-9 cards, $8.99 for C-7 & C-8 cards. 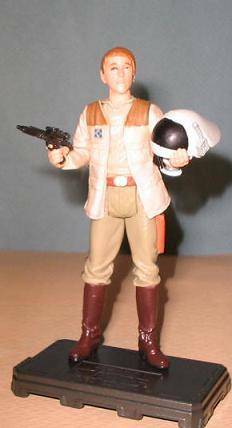 Planet Action Figure has him in a pre-sell deal with Jan Dodonna, Dutch Vander, and the TIE Fighter Pilot for $34.00. Fan’s Choice status aside, Captain Antilles is a pretty middle of the road figure. When it comes to play value, he’s kind of useless. For display he only works as himself for one scene. Luckily he can be customized for other displays pretty easily, and makes a decent enough generic rebel figure –just wish his arms were done with a little less extreme angles on the elbows. On his own he’s pretty boring. There is no Darth Vader figure currently in production that can wrap his hands around Antilles’ neck, and frankly I don’t want to see a big-handed Vader with a “Rebel-Choking Action” feature. Although, if one were made I’d buy it anyway for sheer laughs. So this leads us to the biggest question of all: which Vader figure should one use with Antilles for display purposes, and how can we choke him? It’s a tough call. The best-looking Vaders for this scene are the Comm-Tech version and the Masters of the Darkside 2-pack version that was repackaged as the Death Star Clash Vader. Both have cloth capes and are pretty close to the New Hope costume design of Vader. The Bespin and Throne Room Duel Vaders have an easier time effecting a chokehold, but don’t look as good, especially with the sculpted capes. I ended up attaching the Comm-Tech Vader to Antilles’ neck with two of those clear rubber bands every Star Wars figure comes with to hold their accessories in place. To give him some extra height, I used the Comm-Tech chip/stand he came with. Play around and see what you can come up with.